The use of pearl powder as a cosmetic agent to beautify and lighten skin has been well-documented throughout history. The use of pearl powder as medicine can be traced back to 2,000 years ago in China in A.D 320. Pearl powder was an ingredient in traditional Chinese medicine (TCM) and Ayurvedic medicine. Crushed pearls were used by ancient physicians to treat eye diseases, tuberculosis and to prevent heart attacks. Pearl powder was also used as a beauty aid. China’s only female emperor used pearl powder to maintain her beauty. The empress, Wu Ze Tian (625 AD – 705 AD), regularly took pearl powder internally and used pearl cream on her skin. When she ascended the throne at 65 years old, her beauty had become legendary and her skin was said to be as radiant as a young woman. According to an ancient Chinese medical book (Ben Cao Gang Mu or Materia Medica), pearl can stimulate new skin growth and healing, release toxins, as well as remove sun damage and age spots. Scientists have discovered that pearl powder stimulates fibroblasts, regenerates collagen and promotes skin healing. In Europe, the use of pearl powder started becoming popular more than two centuries ago in the 1800s. A white complexion was very desirable in the 1800s and pearl powder was a popular way for European women to artificially gain a fairer complexion. In this case, pearl powder was applied on the skin as a cosmetic. In other words, it was a type of make-up. 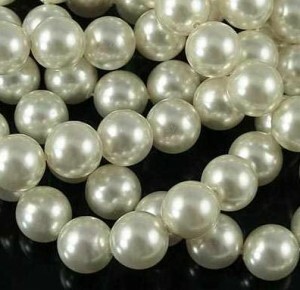 A few types of pearl powder were commonly used, but the best kind was made from crushing real pearls. When applied on the skin, real pearl powder not only gave the wearer a whiter complexion but also a more beautiful one. However, pearl powder made from natural pearls were predictably expensive. More common and cheaper to produce was pearl powder that came from mother-of-pearls and oystershells. However, this type of pearl powder was much less fine and created an artificial shine on the skin. In the past, cosmetic makers used to mix pearl powder with French chalk or talc to make the powder stick better to the skin. Modern Chinese women today use pearl powder to keep their skin looking young and wrinkle-free. Nowadays, pearl powder is applied externally as a face mask and also taken internally by drinking it in a tea. As a mask, pearl powder can be applied directly onto the skin to help lighten dark marks. Mix 1 gram into a paste using a little olive oil. Leave this paste on the skin for about half an hour and wash off with warm water. Used regularly, this mask can purify and smooth skin damage such as wrinkles or age spots. Add one teaspoonful of pearl powder to boiled water and tea leaves. Drinking pearl powder tea is supposed to keep the skin supple and moist. It is also used medically in traditional Chinese medicine (TCM) as an anti-inflammatory and detoxifier. Pearl powder contains amino acids, protein, calcium, polysaccharides and more than 30 essential trace minerals. Je suis à la recherche des nanomètres de Pearl Powder à commander en France ou en Europe pour une expédition vers l’île de la Réunion car j’ai une amie chinoise qui m’a vanté les bienfaits de Pearl Powder. J’aimerai savoir où peut t-on trouver cela en France ? ou ailleurs mais savoir le prix en €uros français et non €uros dollards. Ainsi que le prix du port vers l’île de la Réunion. Remerciements. Where can you buy good pearl powder from??? I have the same question as above, where I can buy pearl powder from? where can I order pearl tea? How to order pearl powder?